The Beatles became as good a band as they were initially because they played together live; a lot. This was the case before they found fame, playing ridiculously long sets while jobbing in Hamburg just out of their teens, and also on their return to Liverpool with their now-famous residency at the Cavern Club. When a band plays together this much, they achieve unique cohesion as players, but also as people. It’s this sense of unity that would help them strengthen their friendships with each other and manage the pressurized chaos that surrounded them during the dizzy heights of Beatlemania. That insanity while on the road would contrast the camaraderie of being in the band together, keeping each other grounded and supported. It shaped the way they made records, too. Each member contributed to the arrangements of the songs as bands who play a lot together do. The music they made therefore was theirs, not the property of any one member. Playing the material live helped them to seal the deal when it came to being a band. But, as history and numerous documentaries have pointed out, touring was not sustainable. They couldn’t hear themselves play over the din of the fans. They couldn’t improve as musicians. And they couldn’t make the kind of music they were becoming most interested in making within the limitations of a sixties-era on stage set up. They had to quit. By August 1966, they did. In many ways, this was a very good thing. It solved a lot of their short-term challenges around being the kind of band they wanted to be; not just an “act”, but artists. In this phase, they made some of the greatest music of their life as a group. Yet, much of that cohesion that they’d gained as a working group facing live crowds together would slowly trickle away. It was an early symptom of the malady that would later lay them to waste as a group. After touring, John, Paul, George, and Ringo went in different directions. John made a movie, How I Won The War with A Hard Day’s Night and Help! director Richard Lester. Ringo went on holiday and rededicated time with his family, later to begin a movie career of his own. Paul wrote a soundtrack with the help of Beatles producer George Martin; The Family Way. And George went to India for the first time, and more on that in a minute. This seems like a pretty innocent set of circumstances. It certainly seems totally viable for people at this level and at this age needing to pursue different paths artistically and personally speaking after such a long time on the record-tour-record treadmill in the same rooms with the same people. And yet, I think this scattering to the four winds had a significance that provided yet another straw the broke The Beatles’ back; they realized that there was life outside “The Beatles” as a single entity. For years, the four men were just quadrants in a collective, moving from airplane, to hotel room, to stage, to recording studio, and back again. They only had each other. When they finally quit touring and had time to pursue their own projects with whomever they wanted, they realized the full extent of the artificial nature of their existence on the road as Beatles. This brief threshold of time between the end of touring and the sessions for “Strawberry Fields Forever”/”Penny Lane”, and later those for Sgt. Pepper, must have felt like a very refreshing one to step through. They were finally free to set their own agendas as individuals, not as branches of a single tree. But again, the cohesion between each member facing the same agenda, the same circumstances, and the same life to unify them as a group was gone for good. It seems to me that the Beatle with the least tolerance for the show-biz treadmill was George Harrison. In addition to an attitude that held all of what that meant in contempt (the real reason he was The Quiet One, I figure…), George as a songwriter had to endure the role as a second banana to the songwriting team of Lennon and McCartney. When you have to compete at that level, being stuck in an artistic box further perpetuated by touring had to have been tough. Yet, George’s skills as a songwriter began to flourish, particularly by the period when the band had begun to cut loose the usual show-biz routine. He was becoming as good as his bandmates, outgrowing his role as the band’s kid brother allotted with only one or two songs per record. By 1965, George also began to explore the music, culture, and philosophy of India in part thanks to Indian musicians he met on the set of Help!, and also thanks to the recurring encounters with the name and the music of sitar master Ravi Shankar, a person who would become his friend and mentor. Harrison’s interests took him to India in the fall of 1966, where he grew a moustache to hide his identity, learned the rudiments of the sitar from Shankar. He was well on his way to a place where he couldn’t help but see the contrast between the fame-obsessed nature of Western pop culture and the values and philosophy of the East. George’s sonic experiments with mixing those cultures on Beatles records after his return to the Beatles’ fold resulted in some of the best music he’d ever make. But his attachments to the band receded as his views of his own relative smallness in comparison to the world of the spiritual progressed. Brian Epstein was not responsible for the quality of the Beatles’ music. But he was responsible for how that music was packaged, and (with the help of press secretary Derek Taylor) how the image of the people behind that music was perceived internationally. If the four members made themselves a band, Epstein made them a group. In addition to all of that, Epstein managed the mundane-but-necessary things vital to a successful rock group so that The Beatles themselves didn’t have to, including bookings, merchandising deals, film deals, promotions, contract negotiations, and a myriad of other things that allowed them the space to concentrate on what they were good at; writing songs, playing music, making records. Thanks to Epstein, there was no reason for them to do anything other than be Beatles, effectively. But in August 1967, Brian Epstein died of an accidental drugs overdose at the age of thirty-two. Up until then, Epstein provided the rudder to The Beatles ship as an organized business interest, but also as a pop cultural entity. Without him, The Beatles had to figure out how to steer themselves. Apart from the business side of things (which we’ll get to), they also had to figure out what being in a group actually meant to them without Epstein there to protect that vision on their behalf. They had to create a new way to see themselves as a union, and answer the question What Is The Beatles? with a self-sustaining degree of confidence. As great as the music they made after Epstein’s passing is, arguably their best at that, I don’t think they were ever able to answer that question for themselves during the life of the group. Faced with the gargantuan weight of what The Beatles represented as a (highly taxable!) business entity, the band were forced to come up with a way to focus their commercial interests and channel their earnings accordingly. Their answer was the formation of their own company, Apple Corps. Brian Epstein had been involved in its conception early on, in part to redefine his role in the organization after the touring era was over. The intention behind the company was to create a sort of countercultural multimedia business, investing in music, but also in film, fashion, and electronics. The company remains in existence today, is still owned by The Beatles and related estates, and is still the force that manages the legacy of the band from its catalog, to licensing, to merchandising, and beyond. But in a certain respect at least, Apple Corps was one of the nails in The Beatles’ coffin as a band. The initial problem was that Brian Epstein had died before he had a chance to solidify the company’s initial business model, and none of The Beatles were business people. Later on, they would become that. But by the time the company launched in January 1968, they were in unfamiliar territory without Epstein’s experience and guidance. They had plenty of mistakes to make when it came to continuing their careers as a band balanced against the pressure of managing their business affairs at the same time. It divided their focus, and it divided the four members too, with some putting in more of a contribution than others. The tensions related to the business side of the group are legendary, and very well outlined in many tomes over the decades. A lot of good has come out of the formation of the company, of course. But it was the source of many arguments about money that would open up a power vacuum, inviting predatory elements to swoop in, and for in-fighting over contracts and royalties to effectively finish them off. By the end of 1967 and into 1968, all four Beatles went all-in when it came to Transcendental Meditation (TM) and the guru who presented it to them, Maharishi Mahesh Yogi. They’d been to a weekend-long seminar in Bangor, Wales which spurred them on to go to Rishikesh in Northern India to study TM further with Maharishi over the course of a month in February to March, 1968. It was sort of a celebrity summer camp for spiritual seekers, with the likes of Donovan, Mike Love of the Beach Boys, jazz musician Paul Horn, actor Mia Farrow (and her sister Prudence), all joining The Beatles and their wives. I think it can be argued that TM itself was something of a reason that the band broke up, an activity meant to be done on one’s own, as an individual, isolating one from being a part of a group by its very nature. In the isolation stakes, I suppose the same can be said for taking drugs, an activity that also ramped up around this time. That said, all four Beatles had very different experiences in India in any case, leaving Maharishi’s ashram at different times. This may help to illustrate that sense of isolation in an even more striking way. Ringo left earliest because of his food allergies and his wife Maureen’s aversion to insects. Paul, ever the most practically-minded and driven Beatle, was next to leave because he had business to take care of at Apple Corps in London. John left with a sense of disappointment and anger over an alleged incident that had the Maharishi making a pass at one (or more) of the female participants. He also became privy to the idea of the Teacher’s interest in the material world, specifically The Beatles’ earning power relative to Maharishi’s Swiss bank account. In seeing the writing on the wall where his fellows’ interest in spiritual pursuits with Maharishi went, George decided to leave to spend time with Ravi Shankar instead. It seems that attendance at this idyllic spiritual summer camp in Rishikesh was a potent catalyst to going their separate ways in a more permanent sense. Notably, it was the last time The Beatles traveled abroad together. Despite the disunity in Rishikesh, each Beatle came away with songs that they eventually brought to the sessions for their next album, ironically titled The Beatles. “The White Album” as it’s known stands as one of the band’s greatest achievements, and against all odds. In contrast to the supreme unity of Sgt. 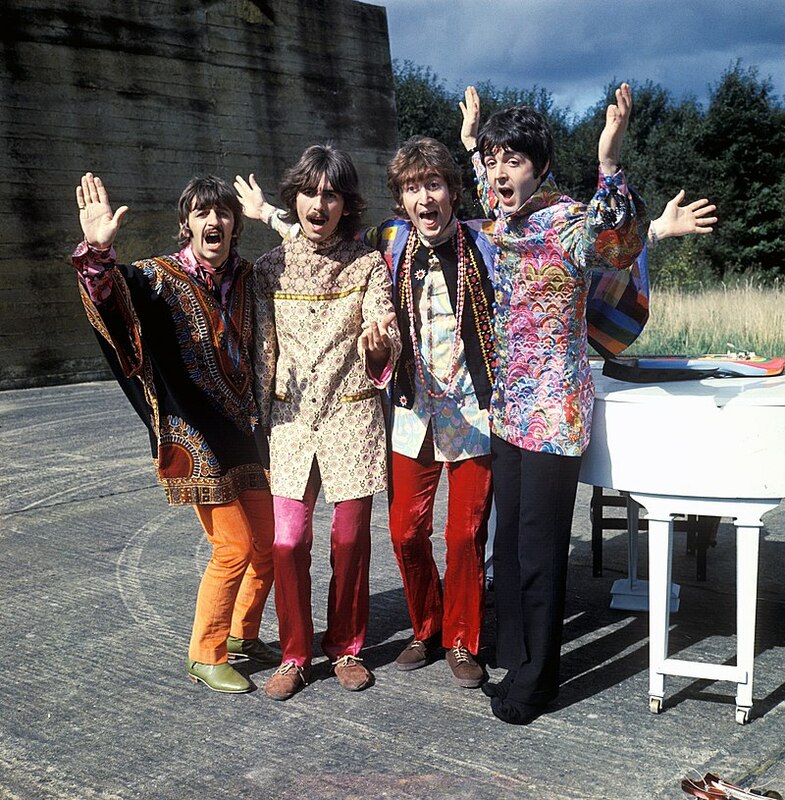 Pepper’s Lonely Hearts Club Band, The Beatles is a sprawling beast of an album that reflected a wide variance of musical interests on the part of each member. This only goes to strengthen it as a musical statement that just keeps on giving even today, almost fifty years later. But I don’t think it’s this ordered chaos that’s the element that makes it another road sign to explain why The Beatles broke up. I think it’s the way it stands as a sea change to how The Beatles made music by this period. In one sense, this started during Sgt. Pepper. But the approach to record-making wherein each member came to the sessions prepared to add his own touches to the arrangements to every song had been replaced entirely by the time sessions for The White Album commenced. Instead of the band working on the arrangements together, the writer of any given song had an arrangement worked out beforehand. Input was not needed as it once was. Paul recorded many of his tracks entirely solo, and much to John’s chagrin in particular. George brought friend Eric Clapton in to play on his “While My Guitar Gently Weeps” instead of relying on his bandmates. Ringo, feeling out of step with the others, left the band only to be coaxed back. In effect, each member became a sideman to the writer of each song, if they were present (or invited!) at all. Sometimes each Beatle could be found in an entirely separate studio working up their own material simultaneous to the others. It was as if they began to distrust each other’s artistic contributions. Distrust is, as we know, fatal to any relationship. With these artistic and business interests in place to demand their energies, The Beatles had to grow up fast. They were in their late twenties, and no longer the young boys they’d been when they first started. They were adults. By the end of the sixties, each Beatle was a married man, and some with children in tow. Marriage requires its own kind of unity, and it demands a large portion of one’s attention and time. That often means that other unions are weakened or less emphasized in order to support it. Each of The Beatles managed this in different ways and with various levels of success. John’s love life is well known by now around this period in his life, slowly detaching himself from his wife Cynthia in favour of his relationship with conceptual artist Yoko Ono, whom John had met at the Indica Gallery in London in 1966. John Lennon and Yoko Ono, March 1969 . For many years, the simple answer to why did The Beatles break up? was that it was all Yoko’s fault. It’s true that their relationship was unconventional. But by all accounts, her infamous and constant presence during the latter days of The Beatles’ sessions was not really her idea anyway. It was John’s. And quite frankly, I think the Yoko broke up The Beatles thing contains too many sexist and racist undertones than I’m altogether comfortable with. Also, I just don’t think it’s true. But what seems to be true is that John, and the other Beatles too, needed something other than the band to sustain them as they got older. The demands of its union were too much to bear by the end of the sixties. There was too little in return to serve them as men and not moptops. Like everyone, they needed the real intimacy of family, not the shadow of one as represented by what the group had become to them. By late 1968 and into the winter of 1969, The Beatles knew they were in trouble. If they wanted to continue as a group, they had to pull something together. They decided to make a movie about recording a new album, all with the intention to bring them back to where they were when they began, to wit; as a tight little rock n’ roll band. So, they embarked on the ambitious project, led mostly by Paul who had taken on the role as the de facto creative director for the band. The results of the project are a matter of public record. As usual, the music they created was great. But what was intended as a renewal of their commitment to being a group turned out to be a document of their individual unhappiness while in one, with open squabbling and listlessness becoming a defining feature to the proceedings and captured for posterity in the film itself. George even left the group during filming in Twickenham, later to return. It’s no wonder that it’s not readily available on Blu-ray or streaming sites today. It’s painful to watch. This is not to say that the project itself was a reason that The Beatles broke up, at least not in an artistic sense. I maintain that Let It Be was a solid idea for a movie, album, and (proposed) concert. It also produced the absolutely wonderful rooftop concert, during which you can see that the band still had it, and were having a good time laying it down after not having played live in a while. Again, the music is sublime. But in the dreary process of making the movie, and in the long and drawn out job of turning hours and hours of tape into a halfway cohesive record, the inevitability of the band’s demise was drawn into sharp focus to the point where denial was impossible. After more drama later in the year and into the next having to do with McCartney’s release of his first solo record against the release date of the Let It Be album (produced by Phil Spector, hated by McCartney), the role that this project played in ending The Beatles is pretty clear. One of the things that sticks in the craw of many Beatles fans is the mundane nature of the break-up of the band. With all of the other things we’ve talked about in mind, in the end it was money and contractual details that dealt the killing blow. How grown-up and boring is that? It certainly runs contrary to the idea of The Beatles as sixties-era avatars to a better and more loving society where all you need is love. The harsh reality was that The Beatles represented a huge financial opportunity, particularly at a time when Apple Corps was in a tailspin in parallel to the degradation of the group in general. It is at these times when the vultures begin to circle. And that brings us to Allen Klien. Klein had a lot of experience with music publishing and with the royalties side of the music industry in general. He had a piece of The Rolling Stones’ publishing, and seemed like the kind of guy to thrash away at the morass of issues that plagued the company and get them back on track. But opinions as to Klein’s motivations were divided to say the least, and remain so today. This culminated in a split between three Beatles against McCartney as to Klein’s rightful role in the business affairs of The Beatles. The result of this, among other things, was a pall on the chances of Lennon and McCartney ever collaborating as songwriters ever again, mostly due to this disagreement over management and royalties. The upshot; McCartney filed to dissolve the Beatles as a partnership after being the first to publicly quit the band, despite the discretion he’d asked of Lennon, who had officially quit much earlier. It was all pretty ugly, and a shocking contrast to what The Beatles represented musically; positivity, innocence, and hopefulness. Their end seemed like a betrayal of that promise. Maybe in the end, that’s what hurt the most. There are some even today that consider The Beatles break-up to be a sudden and tragic event, like a death in the family. It was demonstrably not sudden, with plenty of forces from within and without that contributed to it over a span of years. As for its tragedy, even this is a hard one to call. As great as The Beatles were, many of the things that contributed to the end of the band were necessary to the well-being of The Beatles themselves as four people. As painful as the demise of the group was and still is for many, they were better off as individuals after it was all over. They were better off not having to continue to tour under the conditions of the time; to not be heard, and to not be able to progress as artists. They were better off at being able to get the chance to pursue their own lives as they saw fit outside of the bubble created around them. They were better off taking control their financial futures without leaving it to handlers and managers, and despite their early missteps. They were better off with the freedom to pursue meaningful relationships outside of their narrow circle, and regardless of the opinions of outside parties looking in. With all of that aside, perhaps the tragic part of The Beatles break up where we fans are concerned is this. That we wanted The Beatles to be the beginning of something, not the end. But maybe mourning the loss of a single rock band and the era that they represented for many people was always missing the point. For one thing, as John famously said, we still have the old records. The music remains untouched by all the drama. If we have to satisfy ourselves with that, it’s more than enough. But here’s something else to consider. At the heart of what The Beatles created lies a vision for humanity in which we can create our own hopefulness and idealism in our own lives. Maybe from there we can gain a vision for a better world while we’re at it. As a coming of age story and a quest myth then, The Beatles’ story becomes our quest, our rite of passage to grow up to face the world and change it if we can for the better, even in a small way. I can’t imagine a better way to sum up the human experience. Particularly enjoyed the ‘Yoko’ section. I’ve always thought that John choosing such a strong, creative, unique and quietly dominating character shows exactly the strength of John’s connection to the Beatles and how desperately he needed to break away. Equal and opposite forces, etc. Hi Bruce – nice to hear from you, as always! Otherwise, yes. Lennon in particular needed something real beyond his Beatle John image which was weighing him down. Yoko’s influence aside, this was his mindset so much so that he wrote a whole album about it in Plastic Ono Band. Sure. It’s just the fake country sound I cannot abide! Nice write-up, and I agree with everything you wrote. It’s interesting to me about Yoko: As you mention, she’s a lightning rod when it comes to reasons for the breakup, but as more has been written over the years we see she was not THE reason. However, John’s seemingly complete submission to her, which included taking heroin during the Get Back sessions as a means of “celebrating themselves as artists” or however they put it, was a big nail in the group’s coffin. It is fun to play the “what if” game though. What if they’d taken some time off to recharge, say, after the White Album, do their own things, then regroup. I can’t help but wonder how much they might’ve re-discovered their joy of playing live as a grop if they’d been able to do so with the better amplification and mellower/more mature crowds of ’69 and beyond. It *is* fun to play the “what if” game. I have done it many times during my career as a Beatles nut, even with fantasy tracklistings for new studio efforts and ideas for what a 1976 live album would have looked like. That’s the depths of my nerdiness around alternate timeline Beatles! To that, I also think the “take time off to go solo” track might have helped them go on for a bit longer, and maybe help them define what “The Beatles” really meant for them. Maybe they could have then been able to treat the band as one of many islands in their own respective artistic archipelagos. Even then, I guess the main trouble by the seventies, and after most of the smoke had cleared, was scheduling time to actually meet. It’s all speculation of course, and that’s the fun of it. As people who are not Beatles, that’s our luxury. Perhaps for them, it was more complicated than that.